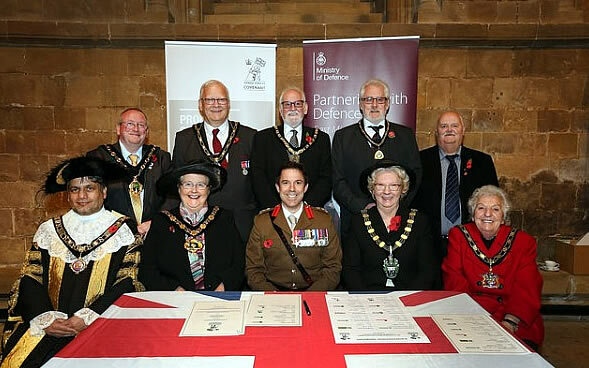 Nottinghamshire County Council held their Centenary Commemoration of the ending of the end of the first world war in Southwell Minster on Tuesday 6 November at 4.30pm. The address was given by the Bishop of Southwell and Nottingham, the Rt Revd Paul Williams and the service was led by the Very Revd Nicola Sullivan, Dean of Southwell, with readings by Sir John Peace, Lord Lieutenant of Nottinghamshire ; Col. David Sneath TD DL; and Veronica Pickering DL. HAC. The Bishop of Sherwood, The Rt Revd Tony Porter, performed a Dedication Of Footballs, which were to be used in The Greatest Games of Remembrance at Nottinghamshire’s City Ground and County Ground on Thursday 8 November.